Palestine’s first wave of resistance poets arrived in the 1950s with Mahmoud Darwish and Samih al Qasim paving the way. In the time that has passed since, we have come to learn new generations of Palestinians who have been raised in exile, many of them women, expressing their views through poetry, art, film and music. Here, we take a look at the work of some of these women, as they share their thoughts on life in exile, cultural identity, and being a woman in today’s society. Beirut born, spoken-word artist and activist Rafeef Ziadah has been writing from an early age, but it wasn’t until a man assaulted her during a demonstration at her university that she decided to perform. The result was ‘Shades of Anger’, a poem about what it means to be an Arab woman today. Rafeef represents a generation of Palestinians raised in exile, in mourning for a homeland they have never encountered and the struggles they face. Using poetry to raise awareness, her poems have become viral sensations. Equally influenced by Brooklyn’s hip hop scene as her grandparents’ stories of life in Lydda, Suheir Hammad became one of Brooklyn’s most prominent poets with the success of her poem ‘First writing since’, a reaction to the attacks on September 11 as both a New Yorker and a Palestinian. She toured with HBO’s Def Poetry Jam for two years and was the star of Annemarie Jacir’s award winning ‘Salt of this Sea’ in 2008. In 2015, Dalia Taha’s play ‘Fireworks’ went on stage at the Royal Court Theatre, making it the first Palestinian work to be featured at a major British theatre. Developed as part of the Royal Court’s International Residency, the play follows the lives of a family in Gaza and the fantasies their children engage in, offering some insight into what it might be like to experience childhood in conflict. Born in Berlin and raised in Ramallah, the young playwright has also published two collections of poetry and one novel. Award-winning filmmaker and poet, Annemarie Jacir is recognized as one of Palestine’s greatest filmmakers, with her 2008 film ‘Salt of this Sea’ chosen as Palestine’s submission for the 81st Academy Awards, as well as being the first Palestinian feature film to be shot by a woman. In addition, her short film ‘Like Twenty Impossibles’ was the first Arab short to be part of the official selection for Cannes Film Festival. Her films portray a variety of characters, from a Palestinian woman raised in the United States who travels to Palestine for the first time, to a young boy and his life in a camp in Jordan in 1976. Chicago-based graphic novel artist Leila Abdelrazaq’s first book ‘Baddawi’ tells the story of her father’s childhood, growing up in a refugee camp in Lebanon. The book looks at the journey of Palestinian people in exile in the ‘60s and ‘70s. ‘Baddawi’ was shortlisted for the 2015 Palestine Book Awards with Leila also taking part in this year’s Palestinian Festival of Literature. Hailed as ‘the first lady of Arab hip hop’, this British Palestinian rapper is a perfect example of young women blending art and activism. 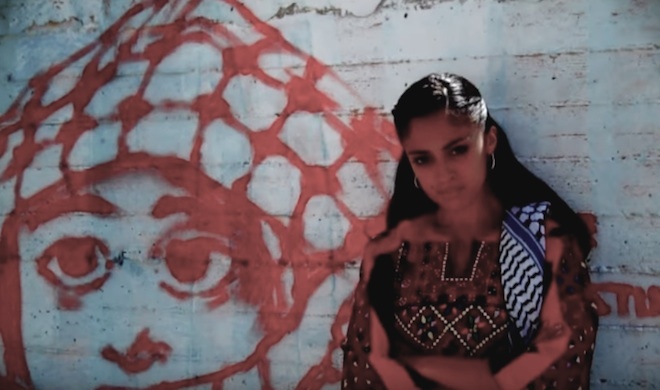 Though her music clearly demonstrates her stance on political issues and resistance to the occupation (her first single was titled ‘The Kufiya is Arab’), she also tackles gender stereotyping in both hip hop and Palestinian society. The rapper refuses to perform before gender-segregated audiences and often wears traditional Palestinian clothing to challenge tendencies that women in hip hop should be overly sexualized, while at the same time honouring her culture and traditions.